ICD is the "International Statistical Classification of Diseases and Related Health Problems" used by physicians to code a given medical problem whenever a patient sees a doctor. This "code" is what is submitted to insurance companies along with medical charges. Periodically, ICD undergoes an update and in the United States, it is about to undergo a MAJOR update come October 1, 2013 to version ICD-10-CM. 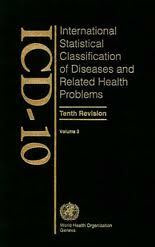 The current ICD being used in the Unites States is ICD-9-CM. What are these changes as it relates to otolaryngolgists? Differences in organization & structure, code composition, and level of detail. ICD-10-CM codes may consist of up to seven digits, with the seventh digit extensions representing visit encounter or sequelae for injuries and external causes. As you can see, what used to be a single code like 380.4 for earwax is now split into as many as 4 different codes based on side. Such increased specificity goes across the board for pretty much every diagnosis. ICD-10-CM has numerous other new features allowing for a greater level of specificity and clinical detail. ICD-10-CM also includes added standard definitions for two types of excludes notes. Excludes1 indicates not coded here. The code being excluded is never used with the code. The two conditions cannot occur together. For example, B06 Rubella [German measles] has an Excludes1 of congenital rubella (P35.0). Excludes2 indicates not included here. The excluded condition is not part of the condition represented by the code. It is acceptable to use both codes together if the patient has both conditions. For example, J04.0, Acute laryngitis has an Excludes2 of chronic laryngitis (J37.0). T81.524 codes for "obstruction due to foreign body accidently left in body following endoscopic examination"
So that's a primer on how ICD-10-CM coding WILL affect otolaryngologists. A lot more time will be spent on coding than now. The American Academy of Family Physicians has produced a superbill comparing ICD-9 and ICD-10. What took only 2 pages with ICD-9 will take up 9 pages once ICD-10 goes into effect. Sigh!